BUMAX® ULTRA is the strongest fastener on the market and is frequently used to replace high strength carbon steel fasteners in critical applications. BUMAX® ULTRA achieves its super high strength from unique strain hardening and precipitation hardening manufactured using Nobel Prize winning Quasi-Crystalline Precipitate technology. This method has been specifically designed for applications where ultra-high strength combined with high ductility is required in the final product. The very high strength to weight ratio in combination with good formability and ductility make it a very attractive fastener alternative to other lightweight materials, e.g. Titanium. BUMAX® ULTRA also has a corrosion resistance comparable with 316L (A4) and can be used at service temperatures between -50 and 400°C with retained mechanical properties. 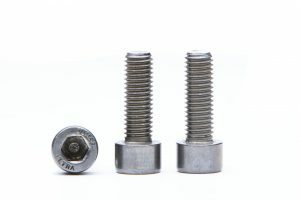 Despite being a stainless steel, BUMAX® ULTRA is frequently used to replace high strength carbon steel fasteners in critical applications with extreme requirements on strength and ductility. All fasteners in BUMAX® ULTRA are custom made to meet the requirements of individual applications and can be delivered with different mechanical properties, with a tensile strength exceeding 1,700 MPa. BUMAX® ULTRA is an advanced engineering grade and BUMAX provides close technical support in order to develop an end solution that fully meets customer requirements. Extreme strength– providing opportunities to downsize and design new lightweight options at lower cost. Excellent weight to strength ratio. Excellent fatigue and ductility properties– despite its high tensile strength, BUMAX® ULTRA offers excellent fatigue and ductility properties compared with other high strength fastener materials. Good corrosion resistance– in most environments, comparable with 316L (A4). Retained mechanical properties– at elevated temperatures. All our products offer full traceability. Reduced number of fasteners needed. Contact us to find out more about BUMAX® Ultra, and how the grade can benefit your applications.